Can Dryer Sheets Hurt Cats? 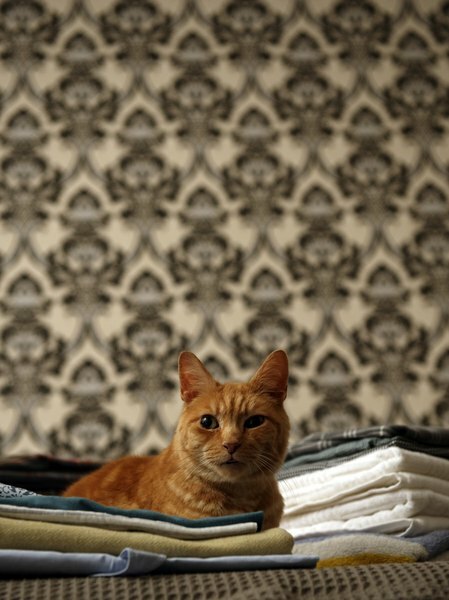 Some chemicals used in laundry products are harmful to cats. Watching your kitty roll about, attacking a dryer sheet wrapped around her body, may be a laugh-inducing scene. The hilarity of the moment might be replaced with concern when you consider the amount and types of chemicals applied to dryer sheets to accomplish their intended purpose. Even though the word "cationic" begins its spelling with kitty's common namesake, that doesn't mean this element is friendly to your feline friend's digestive system. The American Society for the Prevention of Cruelty to Animals indicates cationic (positively charged) elements added to dryer sheets and fabric softeners can cause drooling, appetite loss, oral burns and stomach pain in dogs and other animals as well, but is even more dangerous for cats, whose digestive systems are much more sensitive. Cationic products such as benzyl acetate, benzyl alcohol and chloroform applied to dryer sheets to release softness and fragrance onto drying clothes were never intended to be ingested by cats. The Merck Veterinary Manual warns against corrosive tissue injury it claims is caused by cationics -- particularly for cats due to their grooming habits. The same paws that play with the dryer sheet are the ones kitty licks and brushes across her fur when primping. The toxic elements easily transfer from foot and body to mouth, which is a more direct and more toxic method of exposure than merely rubbing the dryer sheet against the body, creating exposure through the skin. While drooling, appetite loss and oral burns are among the first outward signs that kitty's tangle with the dryer sheet is causing health problems, chances are very good that a trip to the veterinarian will reveal further difficulties from the exposure. The Merck Veterinary Manual warns that cats suffering from exposure to cationics can experience a swollen tongue, depression, abdominal discomfort and increased respiratory noise within six to 12 hours after ingestion. Fever and elevated white blood cell counts are signs the exposure poses more advanced health risks. A cat experiencing a negative reaction to dryer sheets should receive prompt veterinary care to prevent the toxic elements from building up in her system, leading to advanced symptomatic conditions such as coma, seizures, muscular weakness and collapse. Merck outlines the use of fluid therapy and activated charcoal to combat the toxic effects of cationics. Getting a cat to drink milk coats the esophagus, helping to reduce the burning effects of the chemicals. It's no secret that comfort-loving felines are naturally attracted to the warmth associated with laundry pulled fresh the dryer. Cats love to bury themselves under recently dried clothing, towels and blankets in an effort to soak up the heat. Trouble is, dangerous exposure can occur at this point, as the chemicals applied to the dryer sheet are highly active. 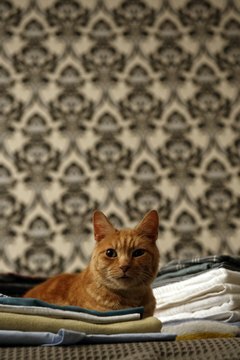 It is best to keep your cat from bonding with your clean laundry by closing the door to the laundry room or the area in which you are sorting and folding laundry. What Are the Chances of a Lost Cat Returning Home? Are Azaleas Poisonous to Pets?